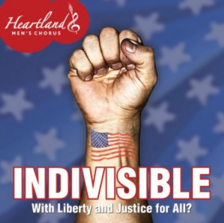 The commemorative choral work being commissioned by Heartland Men’s Chorus is part of its season finale concert Indivisible. This concert will feature songs of remembrance and resistance, patriotism and protest. Often the values we hold most dear – free expression, liberty, equality, justice, and fairness – are also sources of disagreement and division because we are so passionate about them. History has shown that if we’re not careful, forces will use our divisions to deny or usurp the rights and values meant to unite us. America entered World War I to make the world safe for democracy, but even today our democracy does not ensure equality for all. This concert is about honoring and remembering those who wittingly or unwittingly served causes greater than themselves and who sought to leave the world better than they found it, even at the cost of their lives.